What is the Youth Action Hub? The Youth Action Hub is a youth-led center of research and advocacy at the Institute for Community Research and is an innovative model nationally. The Hub is staffed by youth/young adults (aged 16-24 years old) with the first-hand experience of homelessness and housing instability who are trained as action researchers using an evidence-based Youth Participatory Action Research training curriculum. 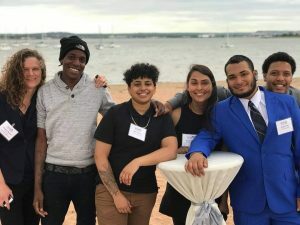 The Youth Action Hub provides a critical youth voice in current research and policy advocacy around youth homelessness in Connecticut. The Hub’s researchers range from between five to ten young people who are part-time employees of the Institute for Community Research and is facilitated and mentored by Dr. Heather Mosher who is a Research Scientist at the Institute for Community Research and specializes in youth homelessness and Youth Participatory Action Research. What is the Institute for Community Research? ICR, a 501c3 nonprofit organization located in Hartford and founded in 1987, helps communities and organized groups advocate for community change through collaborative research. ICR works with diverse groups of youth from around the state to conduct research and advocacy to address important social issues facing youth.